While conducting research for my recent graduate thesis to complete my Master's degree in Educational Technology from New Jersey City University, I uncovered the fact that the maker movement, a seemingly modern creation, actually has its roots traced back thousands of years ago. Confucius and Aristotle were both proponents of learning by doing. Socrates provided a model of learning that is still relevant in the digital age by emphasizing the process of learning through questioning, inquiry and critical thinking. The learning theories first advanced by these early philosophers are aligned with the modern maker movement. Creation of pop-up makerspaces has allowed for this idea of project-based learning to grow and blossom. Using higher-order thinking skills, students are given the opportunity to problem-solve, ask questions, think, create, innovate, fix and revise. A new set of learning theories have popped up as well. Innovation and design theory have become a way of learning, with entrepreneurship at the helm. Preparing our students for the work in the 21st century, where the ability to figure out solutions and think outside the box is fostered, will be the key to success. Makerspaces have boomed in popularity over the last few years. In 2014, the White House hosted its first MakerFaire. At that event, President Obama spoke of our being a "nation of makers" and devoted a week to this cause. Discussing how today's makers can be the next Thomas Edison and help to bring back manufacturing to the US, Halverson and Sheridan (2014) referenced Martinez and Stager (2013), noting that constructionism is the basis for the maker movement's focus on problem solving and digital and physical fabrication. "Bringing the maker movement into the education conversation has the potential to transform how we understand 'what counts' as learning, as a learner and as a learning environment. An expanded sense of what counts may legitimize a broader range of identities, practices, and environments — a bold step toward equity in education" (Halverson & Sheridan, 2014, p. 503). The literature states that makerspaces bring making into the forefront of educational learning theories and then becomes a valued strategy. The art of making allows for inquiry-based creation in an authentic setting and allow the maker to experiment for a large audience. In talking about constructionism, it mirrors what is believed about the maker environment: "learning by constructing knowledge through the act of making something shareable" (Halverson & Sheridan, 2014, p. 498). My technology lab, until the summer of 2016, was laid out in rows of desktop computers, one next to the other, the backs of the monitors facing the front of the classroom. The idea of scratching this traditional model was born out of the lack of its need. I was the technology teacher, chartered with the task of teaching every one of our school's 900+ students over the course of three years. I saw each student every other day for one marking period. The classroom teachers had a student/Chromebook ratio of 2-to-1 in fourth and fifth grade, and 1-to-1 in sixth. Google Drive was available for students starting in our elementary schools. The need for regular computer skills instruction was fading away. I needed to figure out how to re-invent our lab to reflect more current technology education to better serve our school population. It was around this time that my supervisor coincidentally took a group of us (with our director of curriculum as well) to a school in southern New Jersey to see a different kind of school model and tech classroom. I was charged up about what I saw in this teacher's "fab lab" that I wanted to create my own modeled after this "free to design and make" concept, with modifications. With the administration's blessing (of course they weren't going to take me to see a lab that they knew I would love and want to recreate without granting me permission to do so) I wrote our local educational foundation grant for $5,000. The foundation was so passionate about my grant proposal that the director and our director of curriculum decided to apply for, and were awarded, a much larger Bristol-Myers Squibb grant to renovate the lab into a makerspace based on the original project-based, inquiry-based grant description. Over the summer of 2016, I developed a curriculum based on problem-solving, project-based stations using applied technology. My new and improved technology lab was introduced in the fall of 2016, outfitted with work tables and stools instead of rows of computers, a laptop cart and many project based technology tools. This creative outlet for innovation, problem solving, collaboration and critical thinking was rolled out. 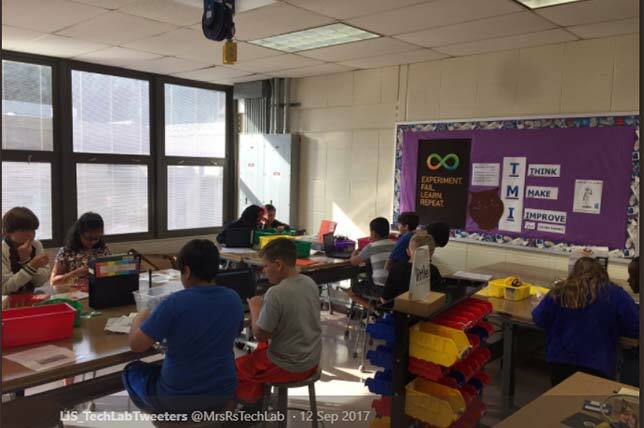 Students work in teams of 4 or 5 per table and rotate within the five skill station circuit in the makerspace-style lab. The students' goal was to complete the challenge presented at a skill station with a small group. Prior to each class I have a brief meeting with the students to discuss objectives for the session before entering the work area of the lab. At Skill Station 1, the students learn about 3D Printing and Design while working independently. After watching four videos about 3D printing, they logged into the 3D modeling and design site (Tinkercad) developed by the Autodesk, a leader in computer-aided design software. On Tinkercad, they progress through tutorials that teach them the mechanics of 3D design. At the end of Day 3 at this station they create at least one 3D object that will be printed on one of the lab's three 3D printers and are given an opportunity to create another. Students are also informed that their Tinkercad account was their account and can be used beyond their time in the lab by logging in using their district Google accounts. Skill Station 2 students work collaboratively in small groups of two or three using Lego WeDo robotics kits to create a robot following step-by-step directions provided by Lego Education. By Day 2 they have begun a challenge (e.g., creating a Cotton Ball Thrower) without the usual step-by-step directions provided, to be finished by Day 3. Skill Station 3 students learn, via tutorials that are built into the software, how to program using Scratch, the drag and drop coding program created in the MIT Media Lab. The Day 2 and 3 challenge was to develop a game to use at the next skill station, Skill Station 4 using the Makey Makey as the game controller for the up, down, left, right arrows, space and click commands. At Skill Station 4, students unbox and set up a Makey Makey. Students then experiment with this tool testing conductive and non-conductive materials. 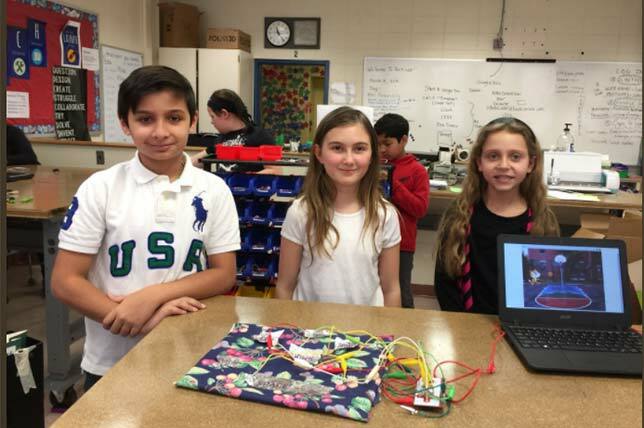 Next, students are presented with a challenge for Days 2 and 3 to create a game controller utilizing the Makey Makey using craft supplies and found objects to the game that they developed using Scratch at Skill Station 3. The Makey Makey controller emulated the controller found in their game — up, down, right and left arrows, space and click. The last station uses LittleBits magnetic snap circuits. Students explore the "bits" using LittleBits information cards that explained each "Bit" and its function. Day 2 and 3 ask them to work through 16 challenge cards that do not state what "Bit" to use. They needed to figure out how to connect the magnetic circuits to complete the challenges. If there was time, they students completed an additional creative challenge found on the Little Bits website. The research questions in my thesis for completion of my graduate program in Educational Technology studied motivation, transference of prior knowledge, collaborative learning, critical thinking and creativity in a project-based makerspace setting. Over the course of a three-week period, I studied 57 students in fifth and sixth grade using a detailed schedule outlining the rotation schedule of five teams of students from fifth grade and seven teams of students from sixth grade. I met with the students every other day during the month of February. 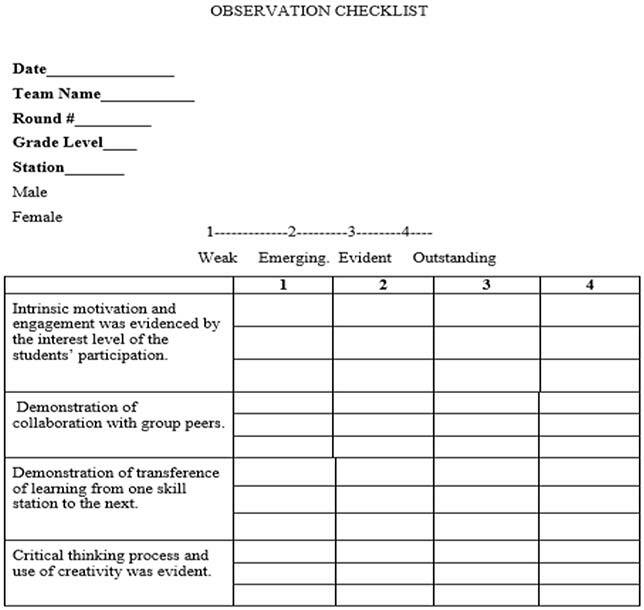 The students rotated through three stations during the course of the three-week period beginning Feb. 1, 2017 concluding Feb. 24, using a rubric shown below, to measure students. The students were excited when they came into the "new" technology lab for the first time. They were anxious to get started and to visit each station. I spent a class period explaining what the new configuration was all about and why the traditional lab changed into a makerspace setting. To be able to fully observe and answer the research questions, I grouped each class of students into teams of research participants. The students who did not get permission to participate in the study were on different teams to ensure that they were not observed for this purpose. This strategy work very well and made it easier to differentiate and observe the students that were a part of the research quickly. The observation checklist (below) was organized well and allowed me to accurately and concisely assess research questions. The participants were extremely enthusiastic to be involved in the study prior to entering the classroom. 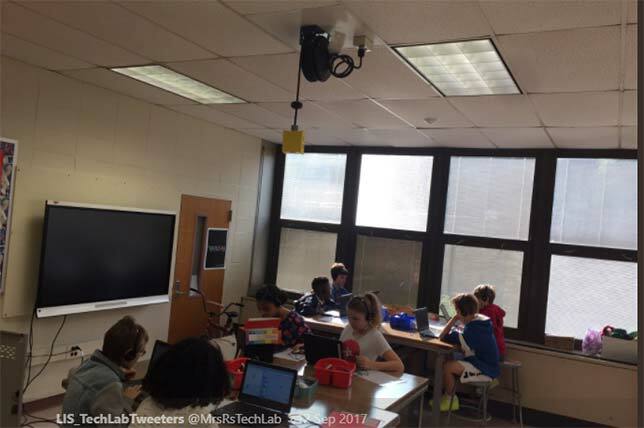 The parent permission letter that was required also served as an introduction to what the students could expect in the technology lab this marking period. During the study, I found that the student's autonomy diminished depending on how many days separated the times in the lab. For example, there was a snow day on a Thursday, which meant that there was nearly a week between sessions for one group. They came into the lab not knowing what to do as if it were their very first day, confused and needing additional direction. Additionally, I found that the motivation and engagement may wane on Day 3 depending on the activity and the level of "hands-on" time that the students experience. I also discovered that while fifth graders were more exuberant about the activities, they were a bit less capable as in reading and discerning directions; while sixth graders had an easier time with this task, their predisposition to socialize rather than focus on that task was problematic at times. The use of written directions in a folder for each station allowed the students to be able to transfer the strategies they used to learn a skill easily, and as they moved through the makerspace circuit, they became more comfortable in diving into a territory that was uncharted for them. 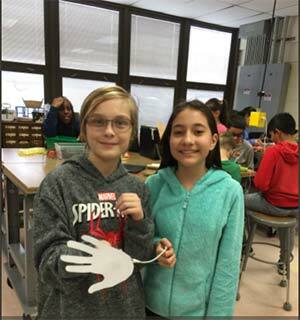 I concluded findings that demonstrate that students can transfer their ability to figure out the expectations in a different makerspace project-based activity once they have gained confidence in tackling new tasks and developing strategies. I also concluded that the students worked well in their groups and collaborative learning was imperative to successful project-based learning environments. The students in the study needed to tackle their challenges in a collaborative effort in order to be successful. Each student brought a different and needed skill set and talent to the task. The skill stations that did not require collaboration to complete a project and where the students worked alone (coding and 3D design) still warranted cooperation in assisting one another through the directions at those stations. The conclusion was that the students worked well in their collaborative teams and that contributed to their success in most cases. I also concluded that students use a high degree of critical-thinking skills and creativity when faced with project-based activities in a makerspace environment. Students were able to pull on these abilities when required in the task. The concept behind project-learning is to use these two skill sets to their fullest and develop them. As an aside, my highly unscientific anecdotal findings demonstrated engagement by my observation of the bathroom sign-out book: it was empty. Not one student left the room during the 42 minute "special." This thesis project reinforced my grant premise, that a hands-on makerspace environment is very motivating, allows collaboration opportunities, permits experience in transferring "figure it out" skills to multiple problem solving situations and provides an avenue for innovation and creativity. Bottom line: makerspaces are doing what we want them to do, and more.